The Verse’s Gem Turner reviews Intronauts at The Old Market in Brighton on 10th November 2018. 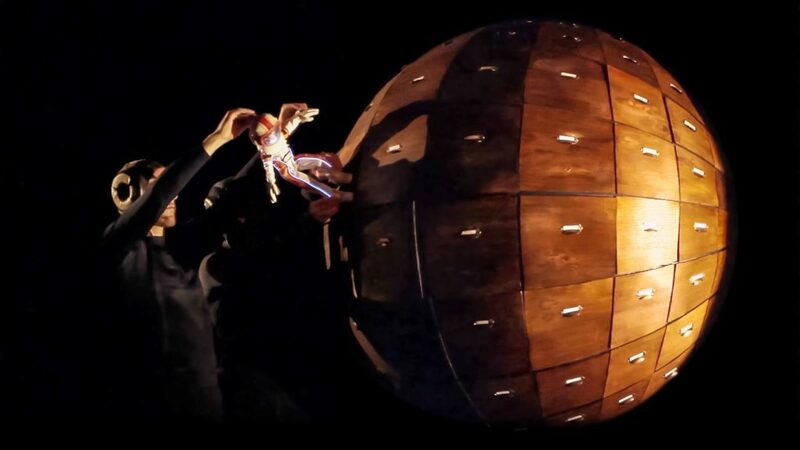 Inspired by 60’s sci-fi classics such as Spielberg’s Inner Space and comic strip ‘Numb Skulls’, Intronauts is a production which combines puppetry, actors in character and visual screens, bringing them all to life. The story is about shrinking humans down to miniature size and sending them into the body to clean and maintain the body and internal organs. There is one place that is out of bounds…the brain. There is a prominent deeper message, ‘the more we use technology, the more isolated we become’. Intronauts manifests a beautiful contrast between ethics and inquisition, and human temptation. Playing in Brighton for two nights at The Old Market Theatre, I was excited to see what Green Ginger had created. The story features a man who is living in solitude; the production offers no obvious backstory, allowing the audience to ponder on the future and how it has evolved. A feature of this production is an interactive projector which cleverly portrays technology as a main character in the story. It was a full house on its first night. We were all unsure of what to expect as previews for this show were quite hard to come by. But clearly, people were curious, and the curiosity paid off. Intronauts suggests the more we use and embrace technology as part of our lives, the more we become isolated and disconnected from others. What was interesting about this play was the contrast in characters. On one hand, the ‘human vessel’ played by Adam Fuller is a professional, living a lonely and composed life. On the other hand, the Intronaut, played by Emma Keaveney- Roys, was a reckless, free-spirited character. However, both have a common trait of inquisitiveness. One thing that stood out for me was the puppetry and music score combined. It was so captivating and emotive, I found myself completely mesmerized, it was really quite beautiful. I also noticed a couple of well-respected members of the industry in the audience, including Andy Serkis, and he all smiled at the Q&A, we all were. There was almost a sense of pride that was flowing throughout the audience as they asked questions to the creators Chris Pine, Emma Keaveney -Roys, Adam Fuller. Chris Pine, artist, director and performer, did explain he and his company claimed residency 500km above the arctic circle in Norway. He also shared a couple of stories about composer Simon Preston’s creating his masterpiece. The score for this play was what excelled it into another dimension. But as a whole, Intronauts is breaking into other dimensions. Not just in its story, but in live theatre also. The layers to this play are memorable and I look forward to seeing what is next from the cast and Green Ginger.